I received an exciting email from an editor at AllFreeCrochet, letting me know that I'm one of AllFreeCrochet top bloggers of 2014! Yay! How awesome is this for a blogger who started 2013? AllFreeCrochet compiled a list of 100 of the most popular patterns of the 2014 and one of my patterns made it on the list. Check out the Top 100 Free Crochet Patterns of 2014! 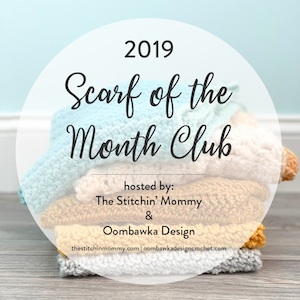 The pattern you loved the most from me last year was the Foolproof Infinity Scarf , also known on my blog as the Doris Infinity Scarf. That scarf has it's own story; it was made especially for my friend Doris, as a birthday gift. That's where the name comes from! I'm so happy you enjoyed it! For those of you who don't know, I have a Designer Page on AllFreeCrochet and 22 of my patterns are currently featured on their site. Please check them all out and stay tuned for more free crochet patterns to come! Happy Crochet!